The 1822 Capped Bust Dime is the Rarest Coin in the Series. The Capped Bust Dime was issued from 1809 to 1837. There were a few gaps in production, as well as several modifications along the way. Other United States coinage of the time carried the same capped bust theme, based on the work of Mint Engraver John Reich. Reich's eagle reverse remained a fixture on U.S. coins until 1891. The 1822 Capped Bust Dime is the toughest date in the dime group. It is seldom encountered for sale in any grade, attesting to its scarcity. In all, there probably are no more than 300 in existence today. Mint records record there were 100,000 dimes struck in 1822, but researchers think well over half of them were dated 1821. The 1822 Capped Bust Dime is one of the rarest of dimes in early U.S. numismatics, and thus an "opportunity" for crooks. Be wary of examples not certified by a reputable grading service. 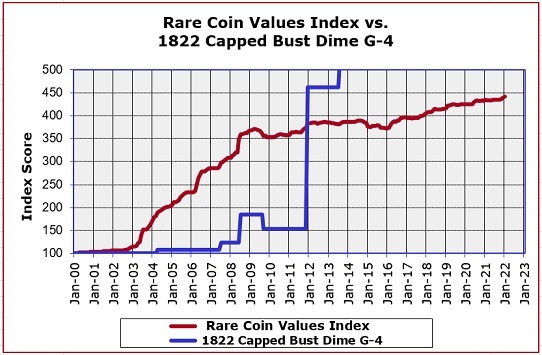 Even though it is a bona fide rarity, the 1822 Capped Bust Dime actually rates below the average of the Rare Coin Values Index, which takes the composite percent change in value over time of a carefully chosen group of 87 rare US coins, the purpose of which is to understand the strength and direction of the overall rare US coin market. The 1822 dime (blue line above) is one of the 87 coins included in the Index (red line). The Index is updated monthly.